1854 Perthes Map of Southeastern Germany. Süd-östliches Deutschland, enthält die Österreichischen Kronländer Erzherzogth. Oesterreich ob und unter der Enns, die Herzogthümer Salzburg, Steiermark, Kaernthen und Krain, die Markgrafschaft Istrien mit der gefürsteten Grafschaft Görz, und Gradisca, Reichsstact Triest, und die gefurstete Grafschaft Tirol und Vorarlberg. 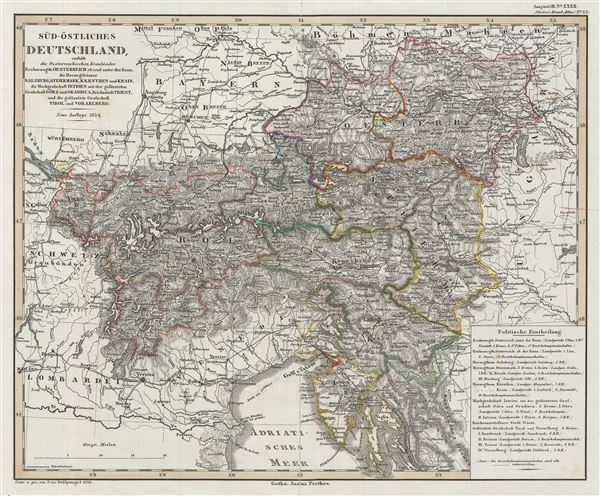 A fascinating example of the 1854 map of southeastern Germany by Justus Perthes. This map covers from Bohemia and Moravia to the Adriatic Sea. A legend in the bottom right corner explains the region's political divisions. In 1848 the March Revolution swept through europe, in particular Germany. These Revolutions were nationalist pro-German, pan-German, declarations of discontent with the archaic autocratic political structure that dated to the 39 original German states established under the Holy Roman empire. The years following the violent suppression of the March Revolution saw a vast middle class exodus from the German states to the United States, leading to 'Germantown USA,' and popular interest among Americans in the Fatherland. Throughout, the map identifies various cities, towns, rivers and assortment of additional topographical details. Political and regional borders are highlighted in outline color. Unlike other cartographic publishers of the period, the Justus Perthes firm did not transition to lithographic printing techniques. Instead, all of their maps are copper plate engravings and hence offer a level of character and depth of detail that was impossible to find in lithography or wax-process engraving. All text is in German. Issued as plate no. 25 in the 1854 edition of Stieler's Hand-Atlas. Very Good. Original centerfold. Blank on verso. Verso repair along centerfold.